On all of the morning and night patrols we collect quantitative data from the turtles we encounter, as well as from their tracks and nests. This year we have also begun taking a more active approach protecting as many nests as possible from both natural and unnatural predators. Metal mesh nets are used to cover each nest we find on Piro beach- so far this method has proved extremely beneficial, as all of the covered nests have shown a high rate of success. All of the protected nests have been left unharmed by predators in the area, giving us at FOO a real incentive to extend this method to surrounding nesting areas. While we are learning more effective ways to curb natural predators of sea turtle eggs, human poaching continues. Having a larger presence on the beach day and night is yet another battle we are looking to conquer. 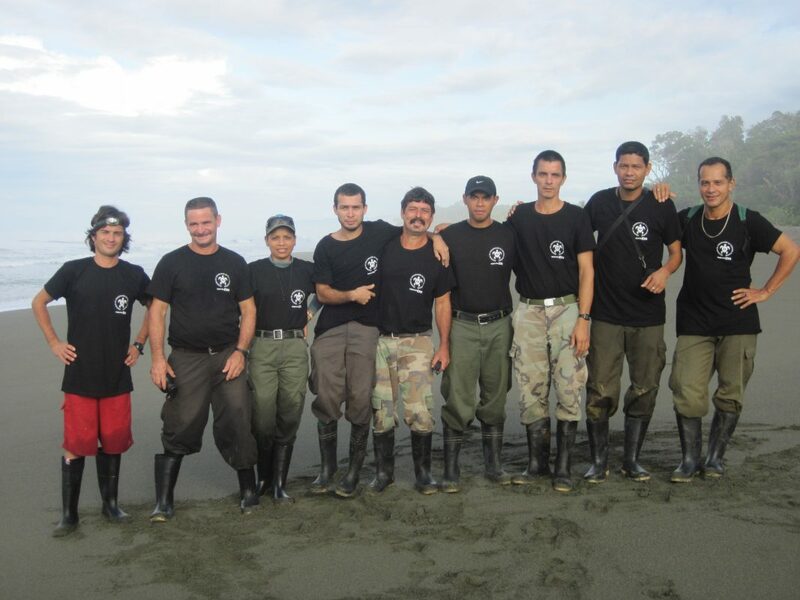 Last week we invited workers from local lodges and 9 members of MINAET, the government body for environmental matters in Costa Rica, for a 2-day course all about our ancient shelled friends. Organized by our environmental education coordinator, Pilar Bernal, the information was focused on sea turtle behavior, current issues regarding their well-being, and what we are doing here at FOO to ensure the longevity of these species… As well as being an extremely informative time, I think we all thoroughly enjoyed ourselves too! 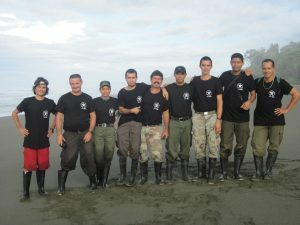 Four members of MINAET stayed at the Piro Research Center for four days after the course to night patrol with us to look for signs of recent poaching and possible culprits. We even learned a little ourselves, like how to crack open coconuts on the beach and enjoy a refreshing beverage compliments of mother nature! We have just welcomed on board Ashleigh from California who will be staying with us at the Piro Research Center until mid-December as an RFA. She recently graduated from California Polytechnic State University and is quite excited to be able to put all of those hours spent in the books to good use. The Olive Ridleys obviously knew about this as just on her second night patrol we managed to collect data from 21 turtles! It was a perfect night for a patrol, with only a little rain and a full moon´s light to guide us. Let´s hope it´s the first of many for our newby! A big thank you to Eliécer Villalta Martínez and Geinor Barquero of MINAET for taking the time to help us here at FOO. Your time and efforts are genuinely appreciated! This entry was posted in Science and Research, Sea Turtles and tagged Friends of the Osa, osa peninsula research, sea turtle conservation program, Sea Turtle Monitoring project, sea turtle volunteering. Bookmark the permalink.